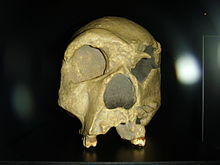 In Europe, H. heidelbergensis is taken to have given rise to H. neanderthalensis at 240,000 years ago (a conventional date dictated by a fossil gap; late H. heidelbergensis in Europe prior to 240 kya is also called "pre-Neanderthal" or "ante-Neanderthal"). 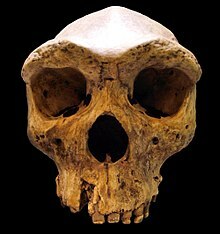 Homo sapiens most likely derived from H. rhodesiensis (African H. heidelbergensis) after around 300,000 years ago. The morphology of the outer and middle ear suggests they had an auditory sensitivity similar to modern humans. They were probably able to differentiate between many different sounds. Dental wear analysis suggests they were as likely to be right-handed as modern people. 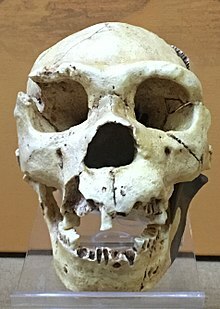 Steven Mithen believes that H. heidelbergensis, like its descendant H. neanderthalensis, acquired a pre-linguistic system of communication. No forms of art have been uncovered, although red ochre, a mineral that can be used to mix a red pigment which is useful as a paint, has been found at Terra Amata excavations in the south of France. Avery, D. Margaret. 2018. "Micromammals from the Type Site of Broken Hill Man (Homo Rhodesiensis) near Kabwe, Zambia: A Historical Note." Historical Biology 30 (1–2): 276–83. http://doi.org/10.1080/08912963.2017.1297434. Friess, Martin. 2010. "Calvarial Shape Variation among Middle Pleistocene Hominins: An Application of Surface Scanning in Palaeoanthropology." Comptes Rendus Palevol, Imaging & 3D in palaeontology and palaeoanthropology, 9 (6): 435–43. http://doi.org/10.1016/j.crpv.2010.07.016. Godinho, Ricardo Miguel, Laura C. Fitton, Viviana Toro-Ibacache, Chris B. Stringer, Rodrigo S. Lacruz, Timothy G. Bromage, and Paul O'Higgins. 2018. "The Biting Performance of Homo Sapiens and Homo Heidelbergensis." Journal of Human Evolution 118 (May): 56–71. http://doi.org/10.1016/j.jhevol.2018.02.010. Hublin, Jean-Jacques, Abdelouahed Ben-Ncer, Shara E. Bailey, Sarah E. Freidline, Simon Neubauer, Matthew M. Skinner, Inga Bergmann, et al. 2017. 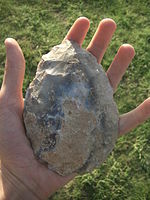 "New Fossils from Jebel Irhoud, Morocco and the Pan-African Origin of Homo Sapiens." Nature 546 (7657): 289–92. http://doi.org/10.1038/nature22336. Perner, Josef, and Frank Esken. 2015. "Evolution of Human Cooperation in Homo Heidelbergensis: Teleology versus Mentalism." Developmental Review, Theories of development, 38 (December): 69–88. http://doi.org/10.1016/j.dr.2015.07.005.